We are a leading Manufacturer of conveyors from Delhi, India. Rubber conveyor belts are commonly used to convey items with irregular bottom surfaces, small items that would fall in between rollers or bags of product that would sag between rollers. Belt conveyors are generally fairly similar in construction consisting of a metal frame with rollers at either end of a flat metal bed. The belt is looped around each of the rollers and when one of the rollers is powered the belting slides across the solid metal frame bed, moving the product. In heavy use applications the beds which the belting is pulled over are replaced with rollers. The rollers allow weight to be conveyed as they reduce the amount of friction generated from the heavier loading on the belting. The belt provides a continuous surface on which to place boxes or other objects. It is almost always made of two different types of material that have been fixed together. The inside of the belt is rough and strong, so as to stand up to the wear and tear of being pulled along by motorized wheels. The outer layer, which is the layer that workers use to convey materials, is usually softer and more impact resistant. Belt conveyors have traditionally had difficulty navigating corners or tight turns. Most belt and pulley systems need to be in a straight line in order to function properly. However, most warehouses do not offer such clear paths between where the objects are and where they need to be conveyed to. In that situation, most complexes use a series of belt conveyor systems. When there is a corner that must be gone around, they will design a series of small conveyors, each of which is at the appropriate angle to make the turn gently. 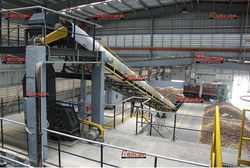 Belt conveyors reduces cost of carrying material from one place to another also increases the efficiency and capacity.